If you ask any Star Wars fan to name their favorite ship, 7 out of 10 people will point to the same spacecraft. Sure, some of them will say the Tie Interceptor, while others will choose the X-wing Starfighter. But the majority will definitely go for the Millenium Falcom, the iconic Corellian light freighter that served Han Solo and Chewbacca through god knows how many space chases and smuggling runs. Shoving any geekiness aside for a moment, this device is far from being a cheap fan service knock-off meant to temporarily satisfy Star Wars fans – it is a high-quality drone with lots of useful features that could have stood on its own even without its pop culture thematic spin. So, if you are ready to make the Kessel run in less than twelve parsecs (sorry), here is what you need to know about this drone. Like its tried and sturdy movie counterpart, the remote control millennium falcon is made out of a durable foam, which means it can withstand a lot of repeated crashes and abuses. This material also provides an extra level of protection to the propeller blades, which comes very handy should you decide to hone your tricks and dodging skills. The drone is sustained by six AA batteries, which gives the device a flight time of more than four minutes, assuming it is fully charged before the flying session. Speaking of the propeller blades, they are attached to four brushless motors designed with coreless technology. This means that the drone has a very low chance of overheating, even if its bombarded with quick, successive commands. Furthermore, it is worth mentioning that the drone is very light and supports indoor flying. It can be recharged either via the RC batteries or connecting it to a computer through its dedicated USB port. A special button that allows users to perform all kinds of cool tricks and stunts, such as spins, flips, and so on and so forth. A useful headless mode for beginners or experienced pilots who do not want to bother with the inverted axis. Six trim buttons for optimizing the flight trajectory. Even though it falls short in some respects, the drone more than makes up for them thanks to its authentic design. The manufacturers put a lot of care and love into the details, creating an almost perfect replica of the famous Star Wars ship. Similar to the original, it has a tired, beat up look, with dirt, scratch and damage marks spread all around the fuselage, as if it spent tens of years dodging asteroid fragments and laser beams through thick space debris. The drone also features authentic sounds and lights from the Star Wars universe, a fact which fans looking for the real deal will surely appreciate. As if it was paying a tribute to old-school pop culture, the remote control itself looks like an Xbox controller, with some Nintendo design features thrown in for good measure. Apart from the Star Wars specific elements – namely the fact that it mimics the ship’s hull design and patterns – , the remote control features an intuitive design and button layout, which makes it extremely easy to handle even for people who have never flown a drone before. The remote control is split into three parts. The upper part features a wireless 2.4 GHz 4-Channel transmitter, with two buttons on each side that allow pilots to access the ‘’hyper speed’’ mode, as well as perform stunts. In the center, you will find one green tinted power button, six soft keys meant for trimming, an indicator which shows the power, and two stick controllers. The right stick is used for moving the drone left and right, while the left one decides the elevation. If you get tired of the Star Wars sound effects, you can easily turn them off through the simple press of a button. When it comes to the flying experience, the drone performs very well even in not so ideal weather conditions. It handles itself very well in tight, indoor spaces filled with all kinds of obstacles and furniture pieces such as lamps, tables and couches. If you live in a house or apartment with lots of corridors and rooms, the drone is capable of taking sharp turns without encountering any issues whatsoever. Despite its larger than average size (by drone standards, of course) the drone is surprisingly silent, so if you feel like playing with your toy before bedtime, you can do so without worrying that you will get on your neighbors’ nerves. The same things apply once you test the drone outside. It takes off relatively easily on windy conditions, and you can safely maneuver it through tree branches and other outdoor obstacles. However, since it has no ‘’return home’’ function, you should plan your flying routes before taking it out. Overall, the Remote Control Millenium Falcon is a sturdy, highly resistant drone that is perfectly suitable for both beginners, and experienced pilots. 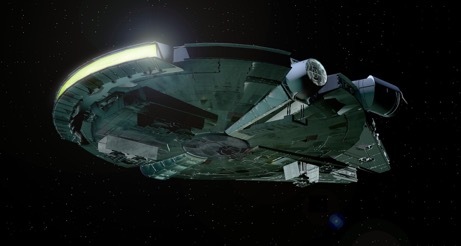 The producers made sure to recreate the feeling and design of the original spacecraft with its beat-up design, a fact which Star Wars fans will surely appreciate. The drone is easy to assemble and fly, so if you are looking for a cool Star Wars collectible, make sure to give this device a shot.